How little is too little? That’s exactly what your Reorder Point will help you determine. Let’s talk about the concept of reorder points, safety stock, and how to put those numbers together to make sure you have the right amount of stock on-hand. When you start your business off you’re probably making orders based on your gut instinct and the money you have on hand, but your reordering can be even more efficient with a reorder point formula. This post will show you what that is, and what numbers you’ll use to come up with a reorder point. The thing to know about a reorder point is that it’s not a static number. It’s based on your own purchase and sales cycles, and it varies on a per-product basis. However, once you have a handle on patterns in your purchase and sales orders for a particular product, you’re ready to start putting the variables together. If we total those numbers, we get 180 total units sold over the past 90 days. That means that the daily sales for the Ghost is 2 per day. Average delivery lead time is simply the amount of time it usually takes for your shipments of a particular product to arrive. You’ll want to have a couple of purchase orders on-hand to check the numbers for this, as the delivery times can vary based on the quantity you order, as well as when you order it. There are a few different ways to calculate this, but averaging things out over the past few months can help provide some context. 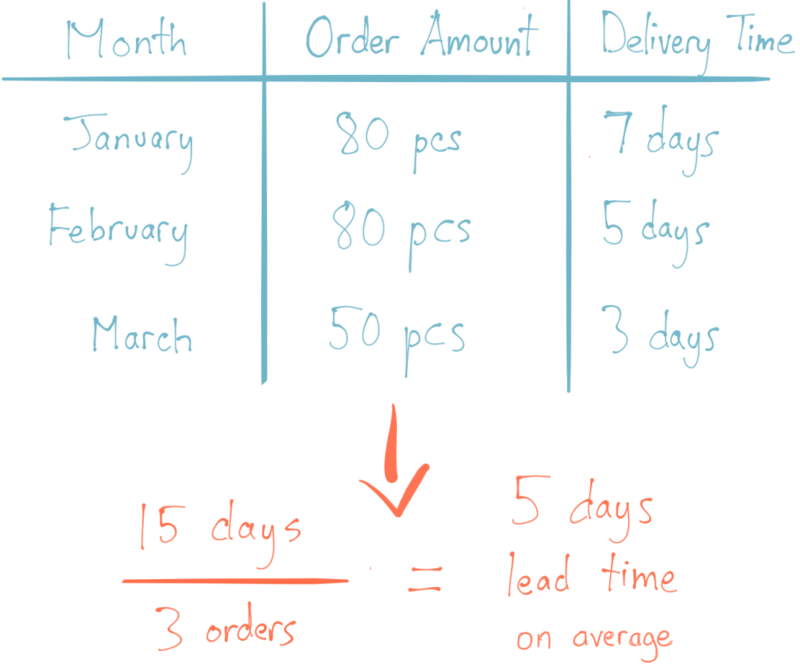 If you add the total delivery time (15 days ) and divide it by the number of orders (3 orders), then that’s an average lead time of five days for the product to arrive. The idea of safety stock is similar to the idea of a reorder point, which is the stock quantity at which you will generate a new purchase order for that product. A reorder point can be the same as your safety stock number, but it’s usually higher to factor in the lead time. Some numbers you’ll want to take into account as you decide on a safety stock level are: average daily sales and the daily average that product used in work orders (if applicable), as well as the lead time. but for this article, we’ll keep things simple by calculating based on two weeks of extra demand (14 days). 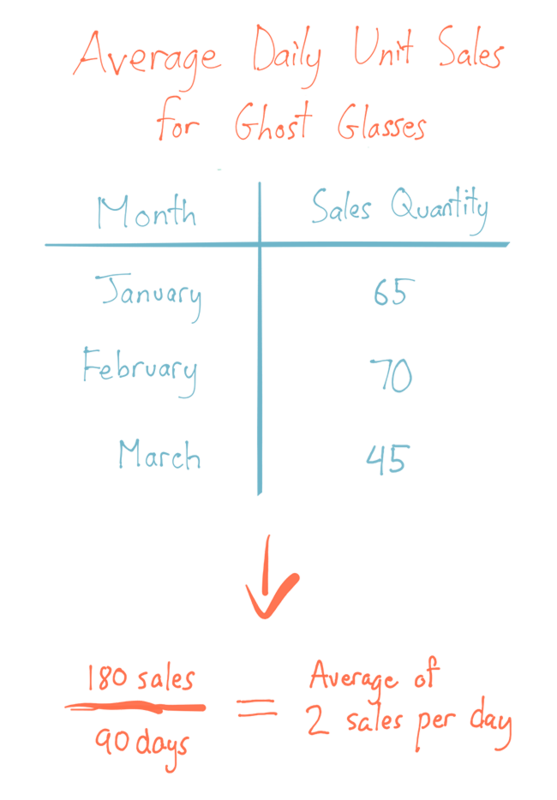 Since the average daily sales for the Ghost are 2 (as calculated earlier on this page), that means the safety stock for Ghost is about 14 x 2 = 28. Now that we’ve got all of the Archon Optical numbers down, we’re ready to put together a reorder point for the Ghost. 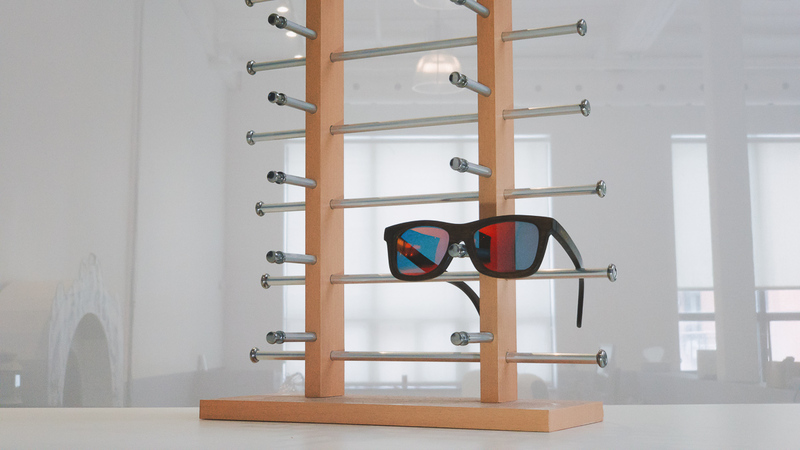 This means that, once the quantity on-hand for the Ghost glasses hits 38, the people at Archon Optical know to put in another purchase order for more of the product. Because they’ve built an average delivery lead time into the reorder point, the extra Ghost glasses should arrive before Archon ever dips below the amount of safety stock. However, even if there are production shortages or delays in shipment, Archon Optical’s safety stock ensures that they can continue to sell the Ghost for two weeks before they run out of stock. Reorder points are incredibly powerful for keeping your business running smoothly. It’s one thing to understand the concept, but they’re no use to you if you aren’t set up to reorder in a timely manner. If you’re a spreadsheet user, you can use conditional formatting for the quantity value of specific cells. It’s a bit of work up front because you’ll have to set it up for each individual cell, but you can set Excel or Google Sheets so that cells turn red the moment they dip below your reorder point, which will warn you when you need to start on a new purchase order. Unlike spreadsheets, inFlow was designed specifically for working with inventory, so you’ll already have all the quantity and reorder point fields built into the program. This already saves our customers a lot of setup time. inFlow Cloud and On-Premise feature a Reorder Stock window, which identifies which products need reordering, and creates new purchase orders with just one click. If you’d like to get a jump start on reordering with suggestions that are tailored to your sales numbers and lead times, we can help with that too! 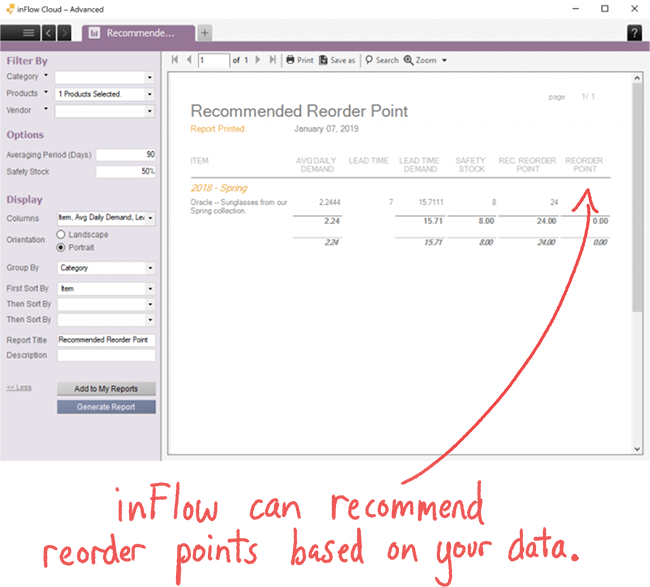 inFlow Cloud has a Recommended Reorder Point report that takes your sales data into account and then recommends reorder points for each of your products. Whether you’re just starting out with reorder points or fine-tuning them, inFlow Cloud can help! Good question, Amalina. We’ll be writing a more specific article on safety stock in the future, but the quick answer is: it’s the amount of extra stock that you keep on hand to ensure that your business is unaffected by shortages in supply (for example, if your purchase order is delayed by two weeks). It’s like a rainy day fund, but for inventory. 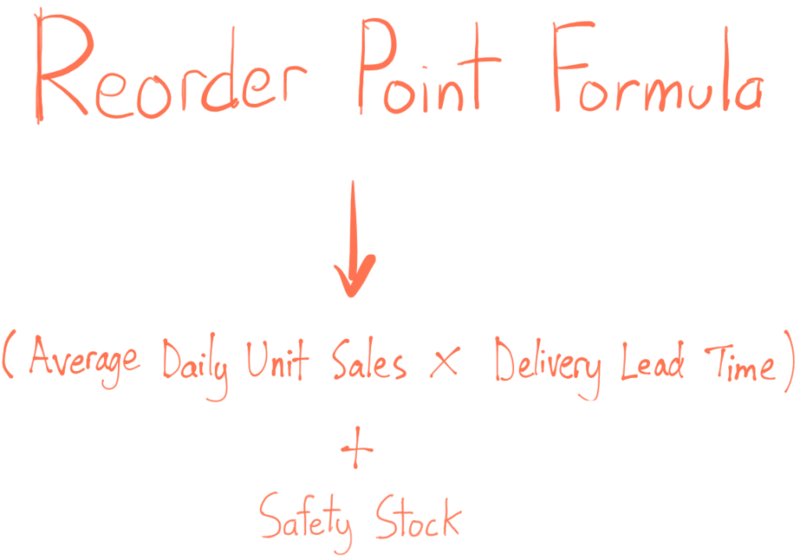 Hi Michael, the reorder point basically becomes your minimum stock level, because you’ll want to reorder once you fall *below* the reorder point. So if you had a reorder point of 20 and you reached 18 or 19 pcs on hand, you’d want to reorder. You’d be below your minimum stock level. Safety stock is calculated as part of that reorder point, the more safety stock you decide on, the higher your reorder point will be. You could only have 29.54 stock left if someone ordered .46, not .54 as you wrote in the article! Hi Tom, thanks for pointing this out! Sorry about that — we’ve made the correction in the post. The following is the consumption of rice in certain hotel. Hi Boniface! Sorry, this post doesn’t deal with max stock levels, but rather the minimum threshold before you *should* reorder. If you’re looking for a min/max approach, you might need a different article for this question (I did a quick search, and this one may help: https://www.lokad.com/min-max-inventory-planning-definition). Its too good and very easy to understand thank u very much for this good efforts dear. Under my area working for a state agency in South Carolina, I have a main warehouse and four smaller sub-warehouses. The smaller warehouses serve specific facilities for the agency and order FROM the main warehouse. Can your system operate reorder points for all of the five warehouses? Sorry for the late reply on this! At present, inFlow’s reordering is company-wide. You can set reorder points for specific products, but reordering would only trigger when you drop below a company-wide stock level of X (not per location). If I understand you correctly, you’d find it more useful if these sub-warehouses could have their own reorder points. This is something we’re taking into consideration for future updates to inFlow, so I’ve added your vote to the list! If this changes, we’ll make sure to get in touch with you via email to let you know! Hey Thomas, very nice article. Please ping me back I would like to discuss more about this. Thanks Chris, what kind of question did you have about reorder points? where or how was 14 arrived at in determining the safety stock? The article was extremely good.it was very useful to me…. Regarding safety stock,I have a small doubt ..why could we take up 14 days stock as safety stock,? That shows you how to treat safety stock as a percentage of lead-time demand. Hi Talent, thanks for reading! We’ll take those under consideration for future topics on the blog! Hi Thomas, I would like to set up par levels for a restaurant where the deliveries are made to the restaurant on a daily basis and I do have the historical usage of product for every day of the week. The goal is to have enough product at the store to meet the demand but at the same time not have too much product sitting at the store how do I achieve this? For reordering, it’s really a balancing act. Since you have the historical usage data already, you can calculate an average daily unit sale and then factor in your lead times — basically following the formula in the article at that point. One point I didn’t touch on in the article was the safety stock for items with a short shelf life, like food. Depending on the time of ingredient, it might only last a few days, so you might have to think about a safety stock levels in terms of days (instead of ~ two weeks like the article suggested). After that it’s really just about watching the low points in your inventory at the end of each day. If you’re constantly running too low on an item by the end of the day, you can increase its safety stock levels. Hi there! Sorry, we don’t have an article on EOQ at the moment, but I’ll definitely consider it for the future on our blog! How to determine minimum reorder level for sand. Helpful article. 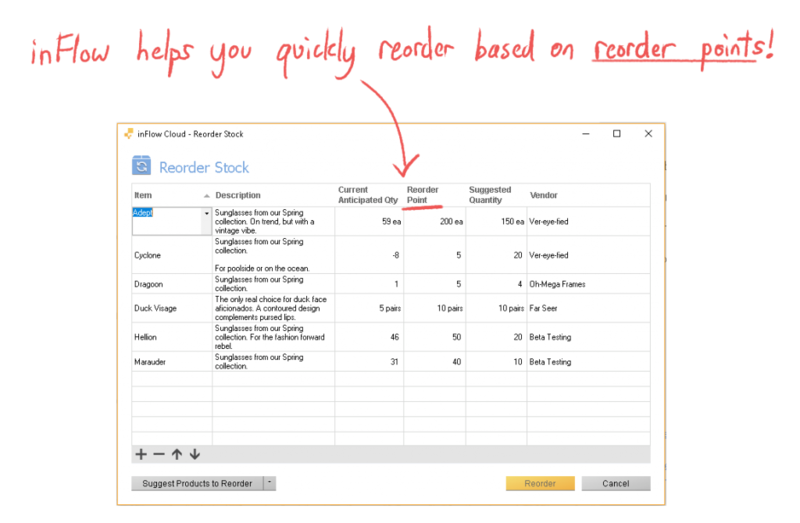 Please describe with example for setting up automatic reminders for reorder points by Excel. This is new formula. Can be applied this formula for arrivals of tourists? Hi Vijay, this formula is meant to help you reorder stock of physical goods before you completely run out, it isn’t necessarily meant to be applied to how many tourists might be visiting a place. I think you might have to google for another kind of formula for that, sorry! There is also a term Goods In Transit(GIT) which is subtracted from this ROL formula but its not here.how can we calculate GIT?? 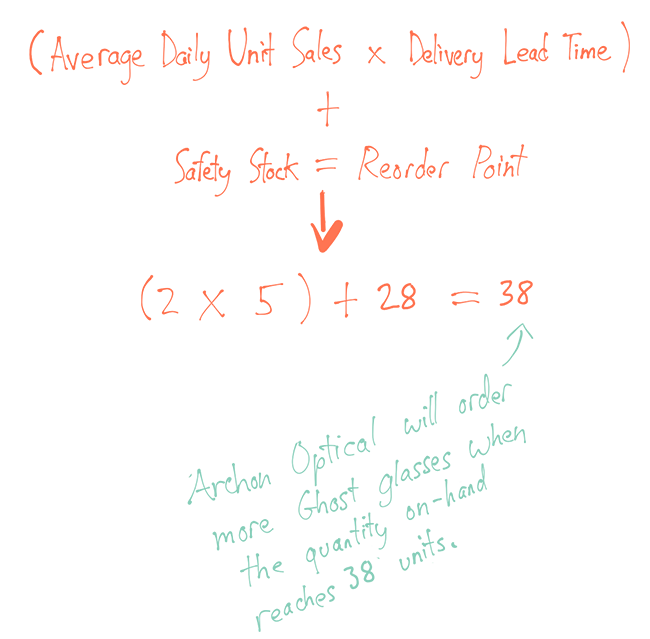 Hi Sanila, sorry about that, this post doesn’t include GIT as part of this formula. But our software, inFlow Cloud, does track the status of products on order: these are products that have been ordered from a vendor but haven’t been received yet. And once you set your reorder point, inFlow will also take the goods in transit into account when suggesting what to reorder. We have consumption data and lead time for the product. Now we want to calculate minimum inventory level, Maximum inventory level, and Reorder level. Hi Mahesh, sorry, this article covers the reorder point (level) specifically. But thank you for the feedback, we’ll consider those other two topics (min/max inventory) for other articles! TODAY BOSS QUESTION ME HOW TO A CHECK ON REORDER LEVEL in software that we use. Software have report (Stock Less then reorder level). But Boss need that how can we check items that come near to reorder level means item reorder level is 500 and he says that when item quantity is near to 600 then u report me about this. how can i do this. Hi Mustafa, thanks for the feedback! As for the question: you could set up a spreadsheet cell with conditional formatting that could turn a certain color as you get close to the reorder point, but I’m not aware of any software that does this (including inFlow). Rather it sounds like your boss might want a reorder point closer to 600 rather than 500, if that’s really the level that he’s worried about. Or the other thing you could tweak is how much you reorder at a time (the reorder quantity). If you keep hitting your reorder point quickly, then maybe the business could try reordering *more* product at a time. Sorry I couldn’t be more definitive with the response, but I hope that helps! What is reorder point formula if lead time is more than cycle time? Hi Subhankar, our article doesn’t discuss cycle time, but after some quick research, it looks like cycle time is the period between when one order is fulfilled and another order is placed. If we’re using that definition, a shorter cycle time would affect the number of orders you’d have in a given period…so a short cycle time would increase your average daily unit sales. A longer cycle time would decrease the average daily unit sales. But in the end you’d still multiply the average daily unit sales by the lead time, so the formula should still be the same, regardless of which number is larger. May i know how if I have 3000 different items? is there another way to count the reorder point? Wow, that was a great piece of article out there for a grab. I’m glad to have read this. Thanks for the thorough explanation. Good article but the report used is not available on the desktop version, unless there is an update I am missing. Hi Gabriel, sorry we missed this one. The Recommended Reorder Point report is a new feature we’ve added to inFlow Cloud for Windows in the past few months. I’m afraid that feature is not present in inFlow On-Premise, but the Reorder Stock window that we mention is available in both versions of our software.